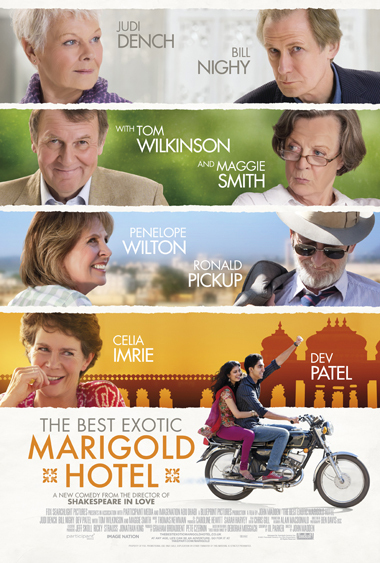 Don’t let the subject matter or the word pensioners used in the film’s synopsis put you off - you will enjoy checking in to the magnificent The Best Exotic Marigold Hotel! Ever since I saw the classy and engaging promotional footage late last year for The Best Exotic Marigold Hotel. I have been eager to see it and it made its way onto our White List 2012 (most anticipated films of 2012). Directed by John Madden the man behind a plethora of uniquely brilliant films including the incredible and underrated The Debt. It features an ensemble cast made up of some of Britain’s finest talent set to imagery and sounds from a story evoking a strong exotic ambience. I was not disappointed by Best Exotic Marigold Hotel I loved it. I loved some bits more than others but this wonderfully heart-warming tale in the tradition of the classic contemporary British films is a class production that succeeds where many others following a similar formula have failed. Think of it as The Breakfast Club 60 years on and you'll go some of the way to the delights it has in store. As the trailer lets you know Best Exotic Marigold Hotel is in essence a fish out of water tale. But never feels formulaic as we follow the lives of a group of elderly people from different backgrounds, come to terms with the reality of their situation, and fulfil their individual stories after finding themselves at The Best Exotic Marigold Hotel for the Elderly and Beautiful in Jaipur, India. - The engaging story full of wit and light emotion - that frankly, given the premise and subject matter - surprises on almost every level as it plays against stereotype as it leads you on a journey. Each of the group have their own heart felt story that starts in Britain in a brilliant opening montage and comes to a head in India - you’ll laugh, you’ll cry, you’ll be touched and you’ll leave the cinema feeling a little happier. - The performances from some of Britain’s finest actors including; Judi Dench, Bill Nighy, Maggie Smith, Tom Wilkinson, Penelope Wilton, Celia Imrie and Ronald Pickup are pitch perfect as they flesh out their individual stories. For me seeing Dame Judi Dench in an emotionally rounded role was a joy to behold, Bill Nighy’s comedic timing is spot on as usual, Tom Wilkinson at his sublime charming best (all without an odd faux American accent), Maggie Smith’s crusty but vulnerable Muriel will win you over and Ronald Pickup channelling the late great Trevor Howard were particular highlights. But there are many other star turns to choose from and everyone will have their favourites. - The faultless direction and production and go a long way in transparently ensuring that performances and story are kept centre stage and then stay engaging whilst there. Although set in India if you are expecting a postcard style travelogue put those thoughts aside The Best Exotic Marigold Hotel is focussed on the characters and their stories set to the backdrop of Jaipur. Many films have tried a similar format - that of an ensemble cast’s characters stories inter-connecting and weaving into a tapestry that completes in a shared experience The Best Exotic Marigold Hotel never feels locked in by the format and comes together in a great tale that is a cut above the rest.